Some say that tablets are dead. I dunno ...they have their use cases. Laptops are still thriving, but really the more mobile, the ...more better...er, ... err, right? Most people I know have a laptop for work situations, but for the majority of their online use, they have a phone. Tablets at one time filled that niche, that in between. Where a phone wasn't quite right and a laptop was too bulky. Problem is that phones are getting larger and laptops getting more 'mobile'. So, tablets have had to adapt to really specialize in that area. Is it a media consumption device, is it a work device ... it has to be both and do both really well. I mentioned above 'at a price', and I wasn't trying to be facetious, there really is a cost involved. The Tab S4 runs at $870CDN (it's on sale for $799 right now) and that's the 64GB version, you want to make it 256GB you add about $130 to the cost. The keyboard I'm reviewing it with weighs in at $200 (it's $120 on sale right now). What do you get for that much? The processor has some chops, that battery is impressive ... but how will it handle? Let's talk about the design of the device first. 10.5" is large, but not as large as you may think. It's easy enough to handle and carry with one hand, but you'll want to use it with 2 hands. It has the power, volume and microSD slot on the one side because the 'pogo pins' are on the other, and that's used to connect to the keyboard. On the top/bottom you have 4 speakers, so you'll get stereo speakers no matter which way you hold it. On the bottom, there's the USB-C connector and there's even a headphone jack for those that still plug in. In the box is the S-Pen, but know there's nowhere specifically to put it without the keyboard case, so don't lose it. It has a nice feel to it, subtle, without being thin or thick that nobody would want to not use it. It feels right. More on it later. Then there's the keyboard. Let's talk about this keyboard. It's meant to be as small as the screen so it's pretty 'short' ... 'slim'. It's going to pack a bunch of keys into a smaller amount of area. You plunk the tablet into the holding on the case. It's a tight fit, so you're not going to be taking it in and out often. The case articulates/bends in such a way that it'll let it act like a laptop with the keyboard, or if you want to bend it all the way around and use it just as a tablet ... but then the keyboard blocks the camera (if we really care about a rear camera on a tablet) but then makes holding it a little thick. You can hold fold it so the keyboard kind of 'dangles' and then you hold only the bottom of the tablet. That's a bit easier. The big advantage of the keyboard is that it has a holder for the S-Pen. Make sure it goes in all the way. It's a little frightening, you may be afraid that you're going to push it too far in and ruin the pen nib... but you won't... or at least I never have. There's a little click when it goes in all the way. If not pushed in all the way it can fall out ... even still, I've had it fall out once or twice. So mind how you carry it. There is no touchpad either. But that's a livable thing. Using the keyboard is fine ... although I do notice a lot of time when I type, that I use the space bar and then hit the SHIFT key to capitalize a sentence or next word, it's like keyboard is still pressed or something... because if you hit SHIFT+SPACE it switches language input ... I see that pop up of "language EN(US)" pop up a lot when I'm typing away on it. Kind of annoying. That being said, I have typed a good portion of this article with this tablet. A bigger annoying bit about the keyboard is that as soon as you detach it, the display turns off. I couldn't find any setting to turn that 'feature' off. In other terms of using it it's just fine. It's a tablet, and it's got its full compliment of Samsung apps etc... some handy, some no so much. 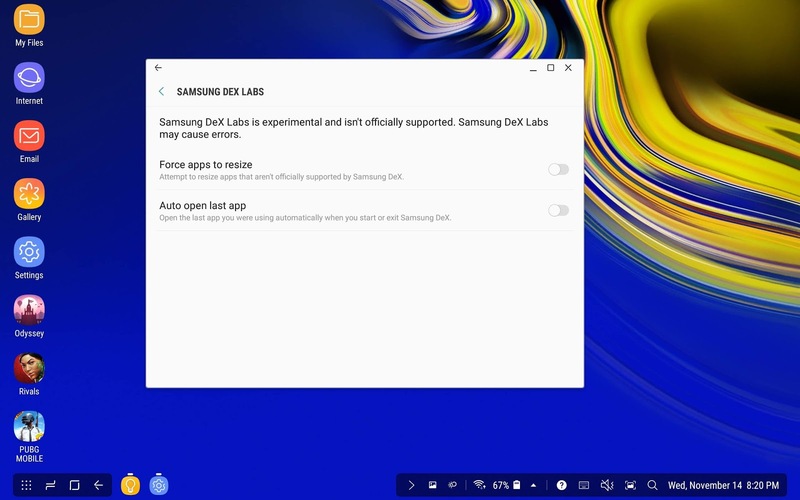 Nothing new here that we haven't really seen in past Samsung devices tho'. One thing we had seen before, but it's brought a little more front and centre with this is the DeX interface. 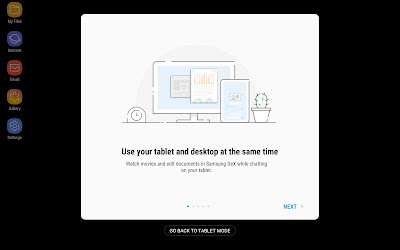 DeX is their "Desktop eXperience" (I think). Like in past you can connect it to an external monitor (you're going to need an adapter tho'). What's nice about this, that I don't think was available in past is the opportunity for dual view. As well, you can just launnch DeX on the device at the touch of a button from the dropdown system tray. This then launches the new interface. We've seen this before, and there isn't anything new from previous that I can tell... but because I'm so not used to it it's been hard to get used to it. Despite being somewhat familiar looking (got a 'start menu' at the bottom left; running app icons in the middle; system tray bottom right) it's not as intuitive as you may be led to think. 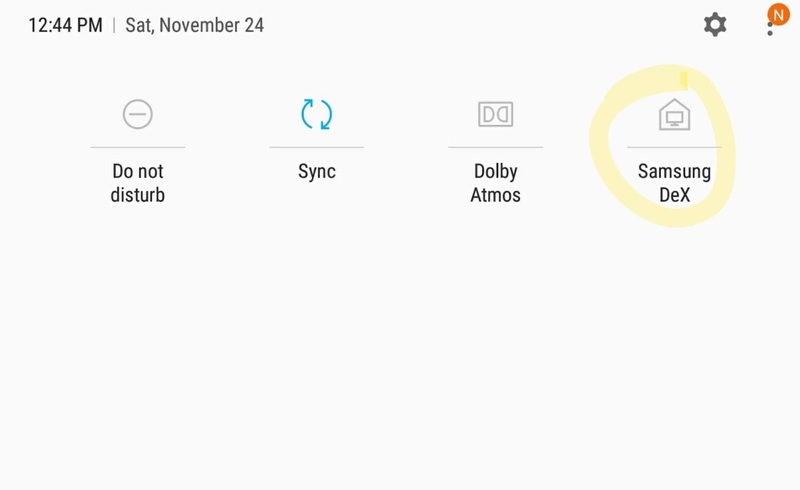 I find myself tapping around that bottom right corner trying to find the system switches (like the DeX button to bring me back to the typical Android interface) or notifications. The tray is normally so wide it's a little overwhelming which is which. 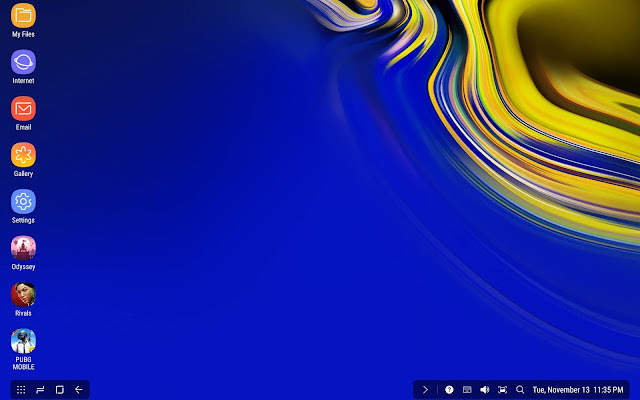 It is nice to be able to have a windowed display. Would definitely be better on a larger screen and having a dedicated pointing device (i.e. touchpad or mouse). 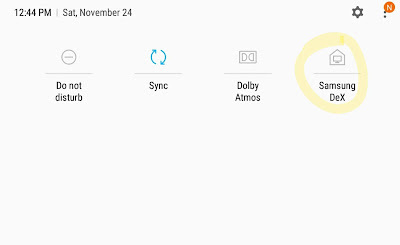 I know it seems counter intuitive for this kind of interface, but I kinda wish we had opportunity for widgets ... similar to how Sony used to do those floating widgets or something. I did have one glitch ... not sure if it's a Samsung app that I have synced, but when I go into DeX mode I have this icon that's just an Android head... kinda greyed out... and just says "application not installed" when I click it. Don't know where it came from, but I was able to remove the shortcut. But it's still in the 'app tray' and I can't bring up any info on it. 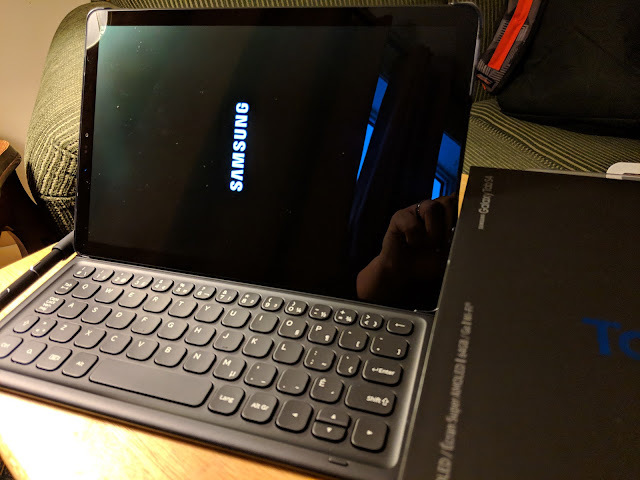 Aside from the unique interface of DeX and the keyboard, one of the key features people will love about this (and it comes IN THE BOX) is the S-Pen. Ihad mentioned how it was comfortable and works so fluidly, it is a nice treat. 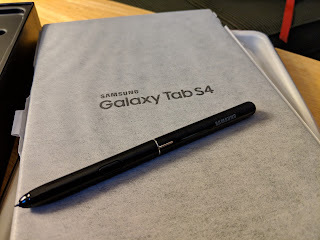 There really isn't anything new to be done with it tho', Samsung really has dialled in what you can do, and do well, with the Pen on a tablet. There's the floating action icon that appears when you start to use the pen that gives you the options available to play with. There's the option to take the pen and just write on teh screen when it's off to take quick notes. Love that feature. The only thing is you have to remember you have the pen, and often I think about using it after the case. I rarely find myself bringing out the pen even once a day. It really needs the right user to make the most out of it. Okay, but how does it perform? For day to day operations, I have not seen any performance issues, any lag, or memory issues. It just screams along. What's been my new benchmark ... primarily because I have a 10 year old in the house is "can it play Fortnite". That it can. I even got myself the "Galaxy Skin" bonus because of it... my son is just livid that he let me log in and not use his account. Fortnite, and PUBG, heavy games, have no issue running on this device. I plugged it into the downstairs TV for some work at one time and didn't notice any performance hit there, using HDMI. So throw something at it, and it'll perform. As for battery, that 7300mAh is going to last a long time. I've been using it for about an hour now, and it wasn't full up when I started, but it's at 78% right now and saying that given this usage I should last another day and a half of this kind of use. So, unless you're playing Fortnite (it lasted just under 2 hours of play, if I recall) you shouldn't have any worry about will it run out of juice. Overall, this is the right product for somebody. The price tends to place it into the realm of those with a very specific use case scenario. I'm not sure that this is for the every day user. It's an uber powerful tablet, but given the keyboard case (which if you're getting this tablet, I'm sure you want to be able to work on it), you'd be less likely to use it as just a tablet. The deciding factor I think for a user is finding the case for a tablet, with a mini laptop that you incorporate the pen into. Looking at artists, or designers. They may be best suited as this for a work like device.